7 years ago, I started attending Camp Starlight. Coming from Florida, I didn’t know anyone here, and I was definitely scared and nervous about making friends. I remember my first day so vividly. 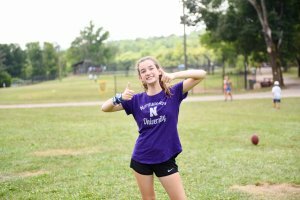 I was on the last bus to get to camp, and when I stepped foot on the clinic field, I was surrounded by the group of girls in my bunk who all already knew each other. They had been here lower junior, and I was a new camper in their bunk. I wondered how I would ever get close to these 7 girls who didn’t know how to even pronounce my name correctly, and were already the best of friends. Looking back on this now, I should have noticed that if the rest of my bunk were so close from only spending 7 weeks together, there had to be something truly magical about Camp Starlight. After only a few hours into my first summer, my bunk and I knew each other better than anyone else in the world. That is the magic of this place that I definitely appreciate because I would have never gotten to know such amazing people, who live thousands of miles away from me. Over the course of the next summers, I got closer to my entire division and many others around camp. This created a huge family from near and far that I know I will have forever. I appreciate Camp Starlight because it turned a group of strangers into a tight-knit community and family. My appreciation for this camp extends beyond the ability to create an extended family. During the months following camp, I missed some of the small things here that I never focused on. When I tried new extra-curricular activities that year at school, I realized how helpful it is to have friends to stand by your side while trying new things like I did at camp. I missed having friends on the sidelines wanting you to succeed at any challenge. Once school started, I missed the sounds of reveille as my wake up call shifted to my alarm clock. I missed going to the health center instead of the nurse, and the singing and cheering in the dining hall instead of a school cafeteria. I missed recall blowing instead of the bell, and I missed super six instead of my boring sixth period. It was these little things that I never came to appreciate and miss until camp ended. After every summer, I go back to Florida, and my parents ask me how camp was and ask what happened. However, the thing about explaining something you appreciate is that there is no way to fully encapsulate it. You cannot learn to appreciate something unless it is gone. When I was a junior, all I wanted was to have later bedtimes, longer shower hours, and higher bunk number. Now that I am an upper senior, all I want is to start the ticking clock of camp over again, and truly appreciate the magic and power of this special place, Camp Starlight. This entry was posted on Monday, November 12th, 2018 at 1:07 pm	and is filed under Summer 2018. You can follow any responses to this entry through the RSS 2.0 feed. You can leave a response, or trackback from your own site.